The balance between the “inner” and the “outer” world is crucial in determining the extent to which a subject’s spiritedness is reflected in a work of art.3 A work of art, must not solely rely on either the inner world, nor the outer world. The balance between the way in which the inner and the outer world is reflected through a work of art, determines the extent to which it is a detachment from nature and a spirited representation of a human subject. The opposite of what has been defined as apprehension of art according to its inner qualities or its “sensuousness”, is the apprehension of art according to its outer qualities. This outer mode of apprehension regards subject-matter as a “purely theoretical relation to intelligence”. This outer apprehension is not concerned with consuming the subject-matter, but on the contrary, coming to know it according to its universality and its “Concept”.7 It is a form of scientific treatment of art that aims to ascribe things according to their universal qualities. As Hegel points out however, this form of apprehension of subject-matter is not intrinsic to art as such and is not adequate to its spirit.8 However, this form of outer universal apprehension must also not be confounded with the “science of sensation and feeling” which Hegel aims to establish as the underpinnings of Aesthetics.9 The science that concerns the intelligent treatment of art does not try to study qualities that are inherent to sensuous individualism but solely according to a pure theoretical interest. The kind of spirit that art must achieve lies in between the two formerly mentioned extremes; the apprehension of art according to its inner sensuous qualities, and the apprehension of art according to its outer universal qualities. The mode of apprehension that is most adherent to the Aesthetic of art and art’s spiritedness, “stands in the middle between the immediate sensuousness and ideal thought.”10 This manner of apprehension is intentionally not yet pure thought (for reasons that would be explained), and even if it is partially sensuous, it is no longer “purely material existent” as organic life, stones, or plants. This sensuousness of this art is ideal in itself, in its own end, and absolute; which is distinguished from the universal kind of an ideal. 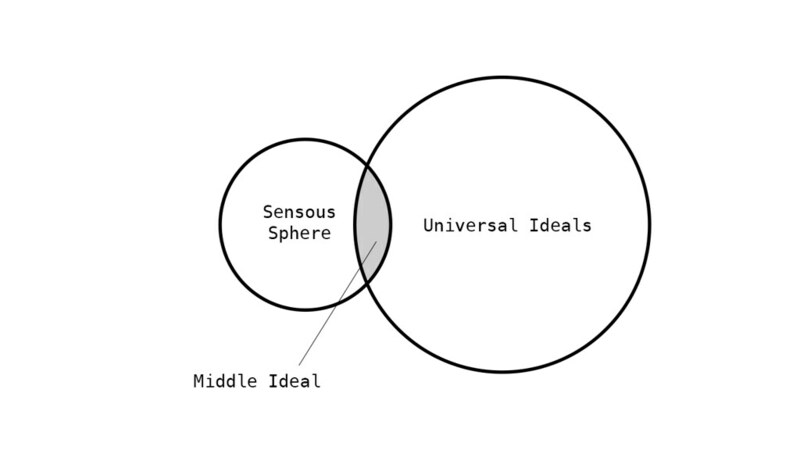 This form of ideal may be referred to as the middle ideal and lies between the peripheries of the inner and the outer modes of apprehension. This is the reason for Hegel to believe that only sight and hearing are able to reach this middle ideal, while smell, taste, and touch must be excluded from the enjoyment of art.11 The reasoning behind this, is that smell, taste, and touch, are senses that are too sensuous, which impedes them to reach a point of idealization, or a point where and ideal is formed. It appears that the senses of smell, taste, and touch are too sensuous, whereas the sense of sight and hearing posses a form of objectivity and level of universality that suffices them to become representations of an ideal — thus giving them the potential to form spirited art. But to reach an Aesthetic apprehension of art through these senses, the ideal in question must strive to reach the middle ideal, and not overarch and attempt to reach the universal ideal, which is excessively objective for the apprehension of spirited art. The variation among the inner and outers forms of apprehension is what guides the human detachment from nature and forms an Ideal in art. Hegel borrows Schiller’s words from his Letters on Aesthetic Education where he states that “every individual man bears in himself the capacity for ideal manhood”.12 The strife to reach the Ideal manhood has been a primary motivation by numerous art cultures, which is synthesized through the modes of apprehension. Although the way in which these cultures recognize their Ideal varies from culture to culture, Hegel argues that the common characteristic among them was the way in which a “genuine man” becomes represented by an ideal that is established by the “State”. It consists of individual persons collecting and combining themselves into a unifying ideal of a man. According to Schiller, this plural unification occurs in two ways; one in which the State conceals individuality through ethics, law, and reason; or when the individual strives to reach the Ideal of manhood through his/her own initiative. In this manner, an art culture becomes occupied with embracing plurality, unity, and a common recognition of an Ideal, to counteract the demands of nature which embrace multiplicity and individuality. It is therefore a human detachment from nature which is organized collectively, and seen as a unification and representation of a collective by one Idea. Architecture works are one of the most proficient forms of art for symbolizing the erection of man over nature, due to the dominant function of symbolism in architecture as such. The story of the Tower of Babel is an example of a structure that was intended to be built for national unification throught the consolidation of collective labour. The excavation and assembly of such an architecture feat is described by Hegel as a “cultural cultivation” of a country.13 The symbolism of Tower of Babylonia is meant to convey a bond and serves as an absolute unifier of men, which can only be expressed in a externalized fashion. This functionality of symbolic architecture is similar to that of sculpture since it gives matter a shape for the perceptible in a material and spatial form.14 The only difference is that sculpture becomes emancipated from its architectural purpose and exists for its own sake. According to Kant, imitation of nature, including the human natural figure, is a way of establishing man as the “supreme end”. This however degrades man’s independent dignity and nature as a whole, where both become a mean and an end.15 This form of instrumentalization of things into means, no longer regards nature and the human figure as something of intrinsic and independent value. For this reason, the Greeks and Aristotle dreaded anthropocentrism because everything else would become subjects that are dictated by the “exigencies of human life”.16 Plato saw that when one makes man the measure of all things use, he becomes user and instrumentalizer, and not the creator of things related to him,17 including art which possesses his spiritedness. The Ideal manhood was recognized in Christianity as well as the Greek Gods. In contrast to other cultures such the one of Indians, Chinese, and Egyptians, who never got beyond formlessness and being preoccupied with defining what is good and what is a bad form, whereas Greek and Christian art managed to establish an idea of beauty.18 The reason why some cultures managed to establish the Ideal of beauty and others have not, was because some cultures determined and secured their mythological ideas, whereas others kept on searching for them without settling. Despite some cultures managing to secure their ideal of beauty and others not, nearly all of them managed to secure their primary purpose for art; that is, unifying every individual into an ideal of a man, and stirring away from nature’s multiplicity and individuality. But beyond the process of detaching the subject from absorption by nature, only a fraction of these cultures managed to establish an ideal of beauty.